A solvent-free, air dried, multi purpose stopper and filler for small holes and grain filling. For interior and exterior use on both hard and soft woods. 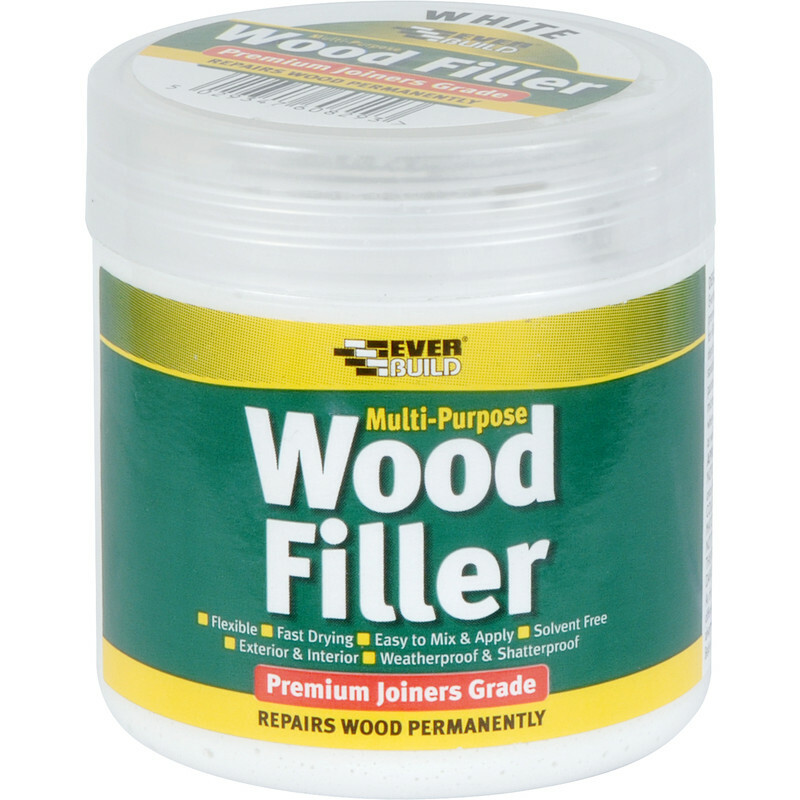 Everbuild Multi Purpose Wood Filler 250ml White is rated 4.4 out of 5 by 51. Rated 5 out of 5 by jdwo from EASY TO USE, EXCELLENT RESULT Bought to fill an old but solid pine table and seats. Filled large and small splits and knot-holes. Applied with paint scraper then finished with belt sander. All simple and straightforward, thanks. Rated 5 out of 5 by Daveez from Good finish Great value product, easily applied and easy to sand, excellent finish once painted. Rated 5 out of 5 by Thelearner from Excellent value Easy to apply and even easier to sand flat. I used this filler to repair some imperfections on a pair of painted french doors. Once primed and a top coat of satin wood applied, the repairs blended in very well. Very impressed for the money. Can't comment on durability, time will tell. Rated 5 out of 5 by Dy200009 from Great Product Had this filler for around 6 montha now and use it on small sections of timber that split when doing doors or filling pin holes on skirting. Mix well before use and if it ever goes a bit stiff, add a drop of water into the pot and stir to bring it back to life. Easily applied and easy to sand! Rated 5 out of 5 by Roby98 from Good size pot for diy. Good price, dries quickly, does the job.